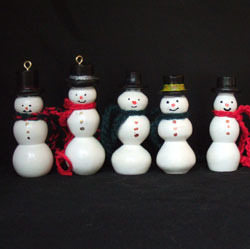 The snowman ornaments are made from maple and are hand painted by Beth. Beth also knits a red or green scarf for each snowman. These ornaments will have you singing “I’m dreaming of a White Christmas” unless that means you will have to shovel your driveway in the morning. We also flatten the back of some snowmen and insert a rare-earth magnet to make a refrigerator magnet. We also make refrigerator magnets from a variety of other hardwoods.